WOOSTER, OH – Over the last couple of weeks, our Keck Geology Team Utah has been hard at work in the College of Wooster Geology labs. 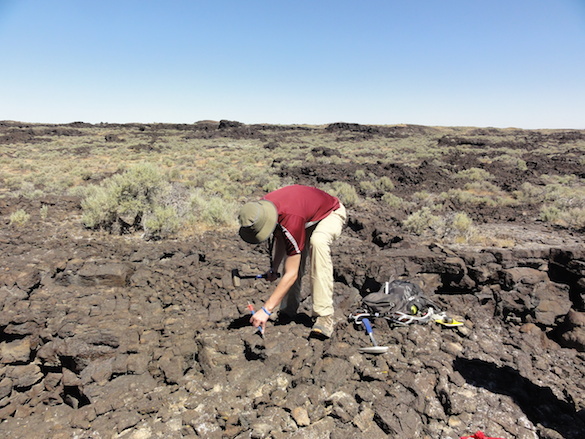 We collected a dozen samples from Ice Springs Volcanic Field in the Black Rock Desert, Utah to understand the eruption history and the age of the lava flows. The first processing step is to powder the sample. 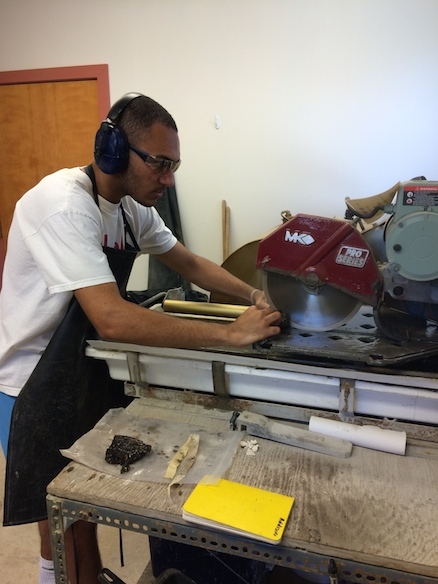 Addison Thompson (’20, Pitzer College) uses the rock saw to isolate pieces of fresh rock. Addison and Madison Rosen (’19, Mt. Holyoke College) use a sledge to break the sawn pieces into smaller bits. Sam Patzkowsky (’20, Franklin and Marshall) cleans the chips so that we can crush them in the shatterbox. 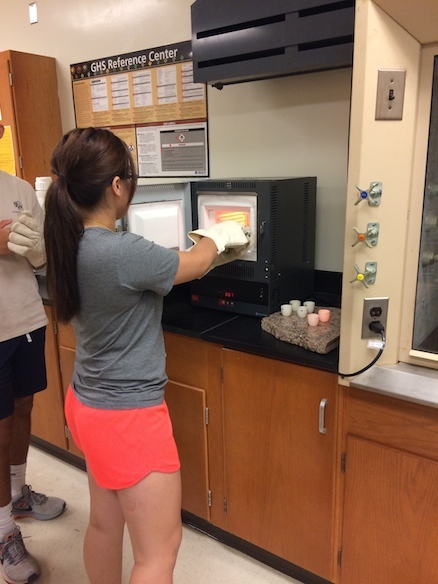 Emily Randall (’20, College of Wooster) sieves the powder and makes sure all of it is small enough for the next step. We sent some of this powder to the Purdue PRIME Lab, where they’ll measure the abundance of 36Cl in our rocks. 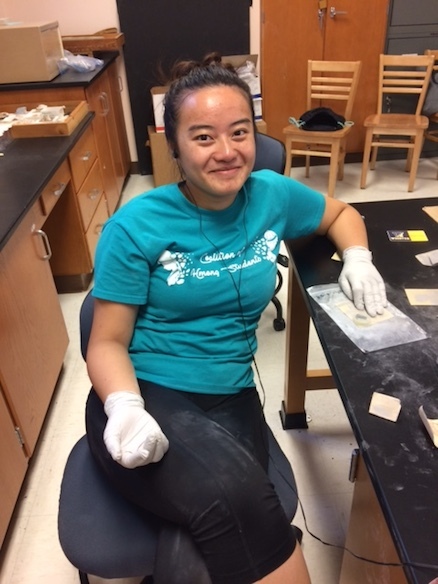 Pa Nhia Moua (’20, Carleton College) pulls samples out of a red-hot oven so that we can measure Loss on Ignition (LOI) to determine how much H2O might be in the samples. 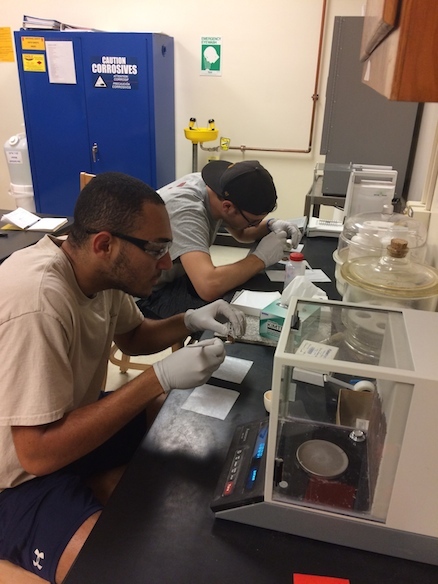 Sam and Addison weigh out accurate amounts of the oxidized sample and flux, which lowers the melting temperature and helps our samples melt so that we can make glass discs. The samples get melted in the fluxer and poured into molds to make glass discs. 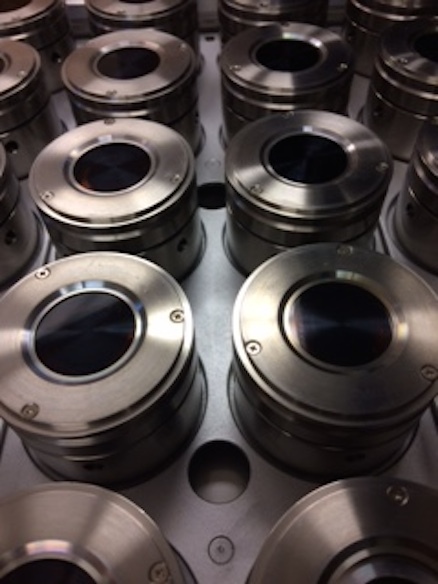 The glass discs are loaded in the XRF and analyzed for their major element chemistry. We use the chemistry along with the data from Purdue and the location and orientation of the sample to calculate an age for the lava flow. We’re using another method called Varnish MicroLamination (VML) dating to provide an independent estimate of the age of the lava. Desert varnish is a dark coating of clays and iron- and manganese-oxides that accumulates on the surface of samples in arid environments. You may have seen ancient petroglyphs carved into the desert varnish. Researchers use the layering in VML to date pieces of rock art. In order to use the VML method, we have to make ultra-thin slides of our rocks so that we can see through the varnish. Addison pours epoxy into plastic molds to mount the VML samples. Pa Nhia has been sanding her VML sample for days to grind it to the correct thickness without grinding away the varnish. It’s dirty, delicate work. By the end of the week, we should have age estimates for the lava flows and a better idea of the sequence of eruptive events that formed Ice Springs Volcanic Field. Check back later for our GSA abstract! 6.26.17 Despite the often inhospitable conditions of the Black Rock Desert, the cohesion of team Utah made the scientific process enjoyable. After the immediate success of the first day, it was given that the group would surpass any benchmark that Dr. Pollock had imagined. The constant willingness for members to go above and beyond what was necessary to advance the mission in the Black Rock Desert was indicative of the excitement the group derived from the task at hand. 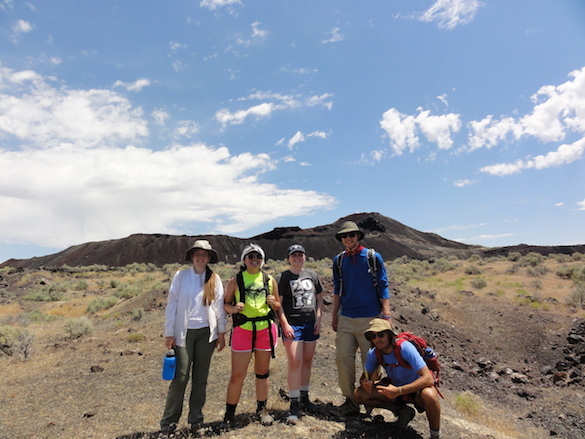 Team Utah with cinder cones in the background. Although sweating, sore arms, and general discomfort at this point was par for the course, the final day in the field was bitter sweet. The group ended on a high note, collecting a total of seven samples on the day. Dr. Pollock said, “finding a suitable piece of pahoehoe is like finding a needle in a haystack”, so the group found two. In addition to the pahoehoe samples, numerous samples were found that were suitable for Varnish Microlamination testing. 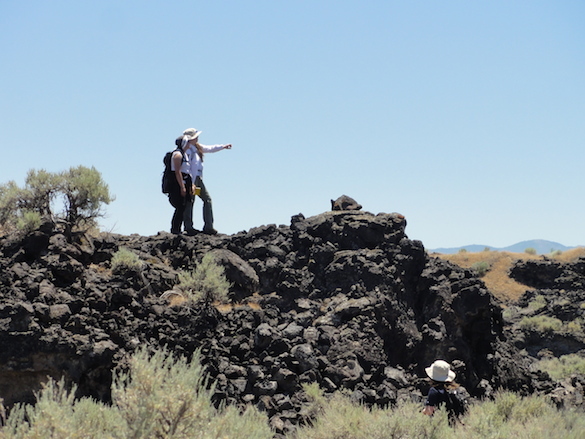 With the day complete, the group left the four cinder cones and their vast, puzzling lava flows in search of petroglyphs that were said to be nearby. These were never found. The ride back to camp was quiet, people were either staring out the window at the expansive Utah landscape or with their heads rocked to the side catching some z’s. Pa Nhia Moua Carleton College ’20 demonstrating proper enthusiasm whilst in the field. As we ventured on our last day in the field, we were determined to make up for our day “off the field”. With pride and gratitude, the team worked hard to use all information we learned on the field to search for suitable samples. Hurrah to Team Utah! The seven samples we collected in one day shows our spirit, our optimism, and our growth of knowledge! And as a plus, a massive lava tube (~15-20 m tall) was discovered, and offered us wonderful protection from the shining rays of the sun. Great job team! Now, may luck and knowledge be with us in the labs! As our trip in Utah comes to a close, I am flooded with all the unique and rewarding experiences that occurred. One of these experiences that stuck out to me was from our first day in the field; right after lunch we had split up into groups to try and understand what the heck was going on in the immediate area. My group consisted of me and Addison Thompson (Pitzer College ’20), and as we trudged off away from the other group, it hit me, I had known this kid for all of three days and suddenly we were thrust into a position to work together to attempt to understand the volcanics of this field, unknowing if we’d have a great dynamic or a poor one. As this work continued, I knew that even if we had different personalities, geology is a field where people can set aside their differences, whatever they may be, and just nerd-out about rocks. It is truly a unique field of study and one that I am excited to continue working and studying in. Oh, and Addison is one heck of a group partner, in case you were wondering. 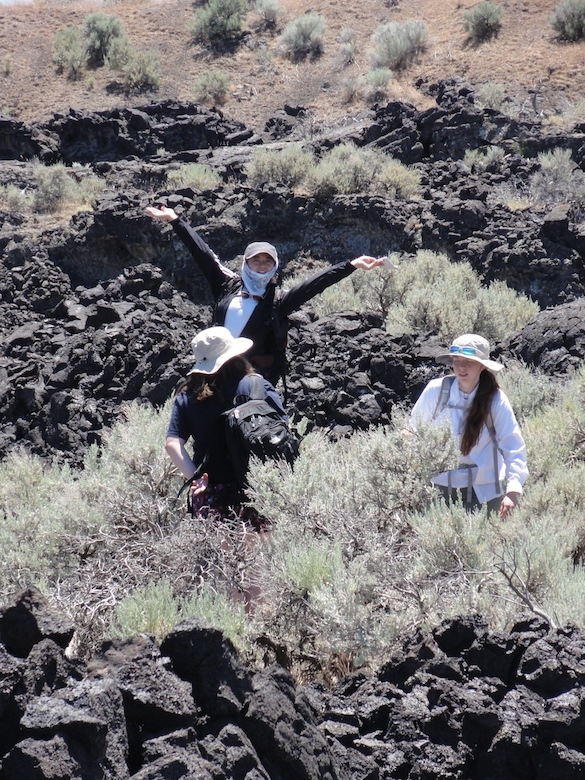 Emily Randall ’20 the College of Wooster collecting a righteous sample of Pahoehoe with colleagues looking on eagerly. Our resident photogenic individual, Sam Patzkowsky, Franklin & Marshall ’20 beating the heat with a crispy apple. 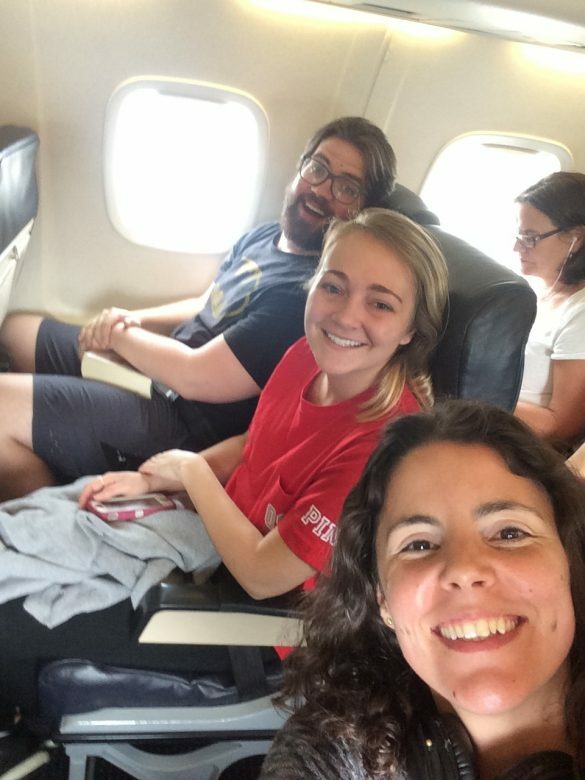 Guest Blogger: Addison Thompson (’20, Pitzer College) writes about our first 3 days of field work. 6.23.17 For the Utah group, the first day in the field was daunting yet rewarding as our intrepid group of young geologists made themselves acquainted with the Ice Springs Volcanic Field. The Ice Springs Volcanic Field, located in the Black Rock Desert of Utah, is home to many old cinder cone volcanos that currently lay dormant. In the past the cinder cones were active volcanos, spitting and oozing lava. The lava flows have since cooled and currently take the form of basaltic rocks spilling out from four primary cinder cones, Miter, Crescent, Pocket and Terrace. The day began at 7:15am with breakfast, after which foods were divided for lunch, sandwiches were assembled, and packs were equipped and made field ready. Everything was ready, as was the team and off the Utah group went to the field site, arriving just after 9am. After days of anticipation, stepping out of the car face to face with what the group had read so many articles and papers about was magical. In no time, the group was on their way, climbing up the service road, and eventually up the cinder cone named Miter in order to get a lay of the rocky land. The terrain comprised uneven, sharp, basaltic rocks and was difficult to traverse, but the group managed. 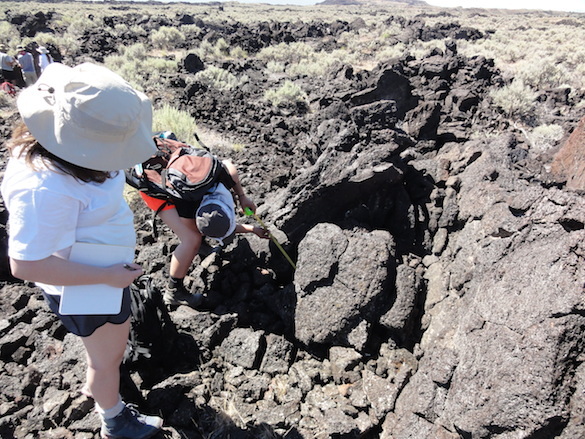 After climbing Miter, the next move was to follow the presumed Miter lava flow path which eventually emptied into a flat basin, an area interpreted to be where a lava flow once pooled. A good section of pahoehoe, a ropy formation of a basaltic rock, was quickly identified, and its sample was taken. 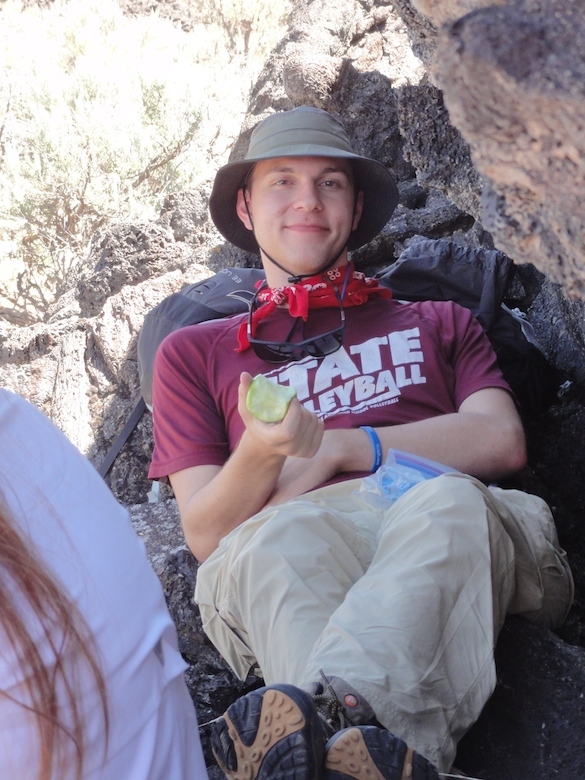 Sam Patzkowsky (’20 Franklin and Marshall College and Team Keck member) dislodging a piece of Pahoehoe to be used as a sample. With the success of the pahoehoe find, it was time for lunch. Shade was hard to come by, so people did their to take refuge from the incessant beating of the sun. Water was a must. 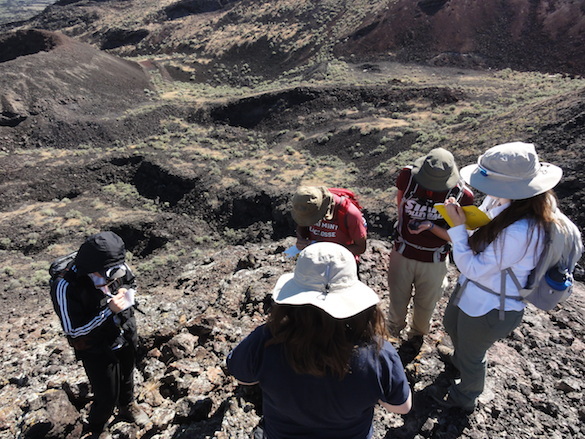 After lunch the group split up in the attempt to identify the Mitre/Crescent lava flow boundary, not an easy task. Regardless of the difficulty, progress was made and we ended the day with promising evidence that could work towards our hypothesis. After a long first day in the field, morale was high but energy was very low; dinner was a welcomed sight. 6.24.17 Waking up on the second day was a breeze. The group had a plan in mind and very little was left to chance. First on the chopping block was a visit to the Carbon-14 dating site followed by accessing the area that is believed to house the Miter/Crescent boundary. Sadly the Carbon-14 dating site was only accessible by a private road, so that idea was nixed. Next up was entering the lava flows from the north west side via a rarely traveled dirt access road. The going was bumpy but eventually the car made it to a suitable stopping point. The walk to the toes (the extent) of the lava flows was a brief flat jog that took minutes; however, the real challenge began when it became necessary to climb the lava flows in order to press on. Over the course of the trip, the sharp basaltic rocks have claimed many a causality, so the group favored precision over speed. In searching for Miter/Crescent boundary evidence, it was impossible to ignore other important geologic occurrences. One of these interesting being a large boulder, about 8ft. tall, comprised of lava bombs that must have been part of a cinder cone that rode a lava flow to the edge. 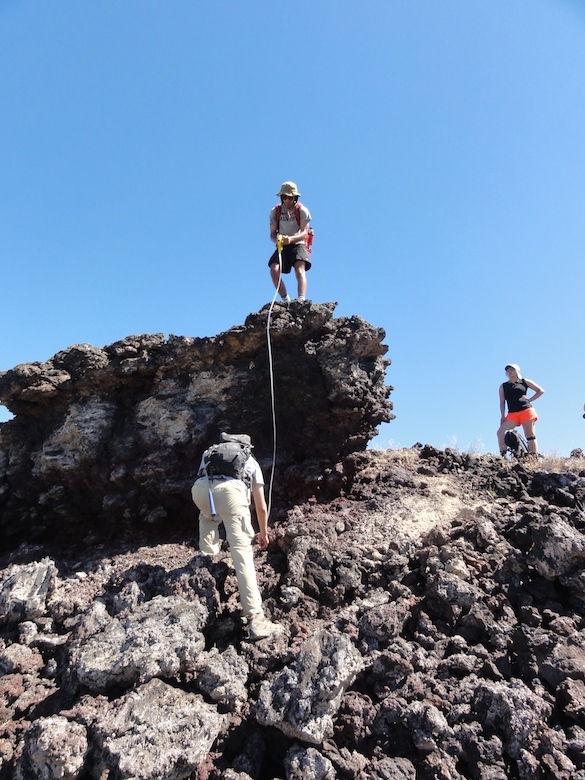 Measuring a boulder that was transported to its current location by a lava flow. This helped give an idea about the power of the flows. Measurements of the boulder were taken along with photos for reference. As the group pressed deeper into the flows they began to notice an accumulation of large basaltic slabs sticking out of the ground in all directions and angles. Dr. Pollock noted that information about these slabs could be important towards our ultimate goal, so slab measurements needed to be taken, twenty in all. Taking a slab measurement consisted of noting the coordinates of the hunk of rock, its width in centimeters, taking photos of the slab under examination, and lastly noting the size of the vesicles (holes created by the expulsion of gas during the cooling process). Two members of Team Keck measuring a slab’s width. The reward was lunch and maybe shade. Luckily, shade was easier to find than the day before and the group crouched, laid, and sprawled under the angled rocks. But like all good things, lunch came to an end. 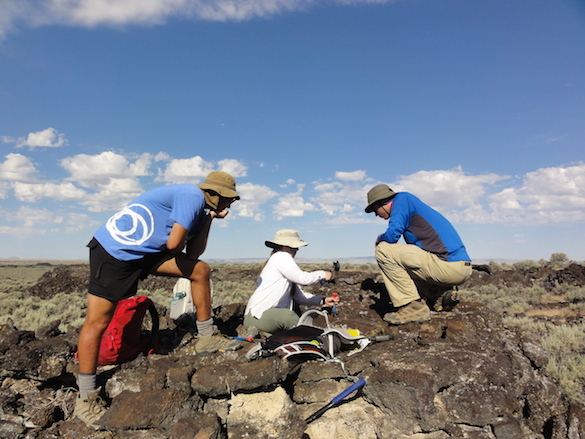 Regardless of the heat, the group was always eager for more field work so they decided to push farther east in search of a boundary that had previously been visible from a birds eye map. At the boundary, samples were to be taken for geochemistry analysis. Eventually the boundary was reached and the samples were taken. After a efficient day in the field it was time to turn around. Dinner was burgers and everyone went to sleep soon there after. 6.25.17 The third full day in Utah did an excellent of of testing everyones nerves. A special thanks goes out to Dr. Pollock for her cool disposition in the face of a turbulent situation. The day began as a normal day does with breakfast, then lunch packing, and finally going over the mission of the day. The catch was that the back right tire of the car that didn’t want to go along with the plan. Minutes away from the field site the low tire pressure sign flashed on the dashboard so the group turned around and went to go get air for the noticeably deflated tier. However the issue was that the tire had a puncture, not that it simply had low pressure. With the spare now on the car, there was no backup and driving over rocky terrain without a spare tire is a disaster waiting to happen, so the call was made to switch rental cars. This required Dr. Pollock driving the rental up to the Salt Lake Airport to exchange cars, a two hour trip both ways. This exchange took a majority of the day so there was sadly no time left for field work. This was definitely a disappointment, but the group handled it well. The day was instead spent relaxing, uploading information from the field and doing any other minor housekeeping chores. 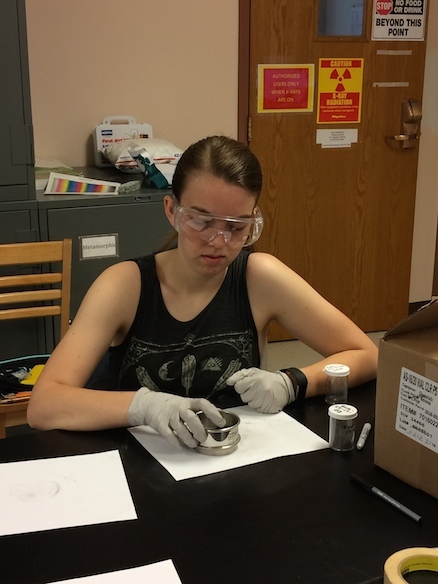 Emily Randall (’20 College of Wooster and Team Keck member) created a map locating every coordinate where a sample had been taken. Finally towards the end of the day a few members went on a hike along an ATV path that wound towards the mountains behind the camp site. A panoramic taken from the hike. Although no field work was conducted it was a productive day. 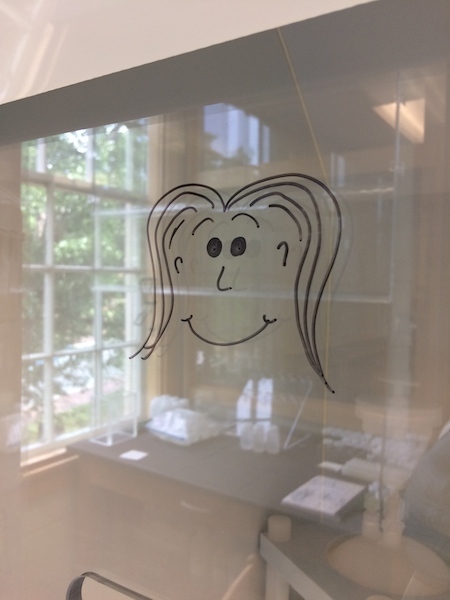 Chapel Hill, NC – Every scientist who works in a lab knows that labs have unique characters. 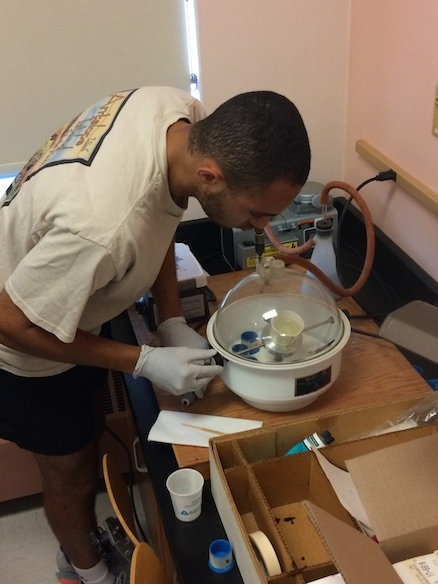 The Isotope Geochemistry lab at UNC Chapel Hill was bustling with Ph.D. researchers, graduate students, undergraduate students, and researchers from other institutions, including Appalachian State University and The College of Wooster. 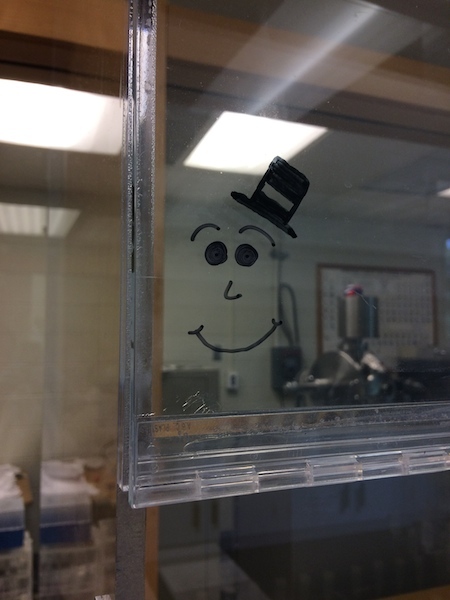 We could tell it was a happy lab community by all of the happy faces. 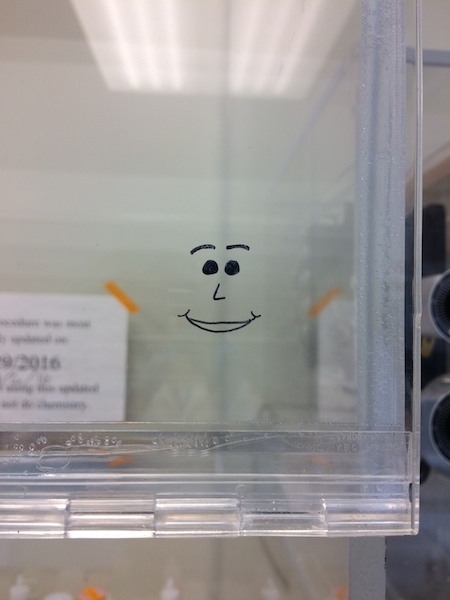 The faces weren’t just on the researchers; they were drawn on windows, hoods, and sticky notes. Here are few to brighten your day. There was a single angry face in the bunch. 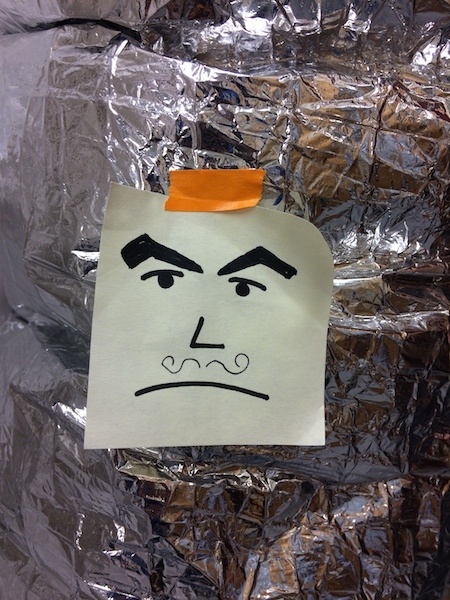 We called this Samarium Face (Sm-face) because Sm is apparently a finicky element to analyze by mass spectrometry. Maybe someone should make a Sm-face emoji. 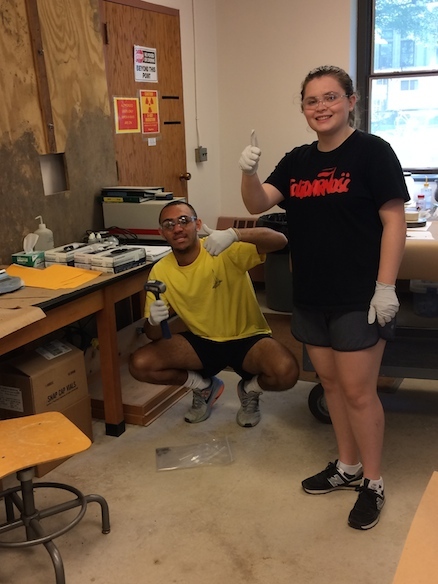 Chapel Hill, NC – Wooster Geologists have been hard at work preparing samples for isotope analysis. Now that sample preparation is complete, the next step is to analyze them on the thermal ionization mass spectrometer (TIMS). In the TIMS, a sample heats up until it ionizes, created a beam of charged particles. The charged particles are sent through a mass spectrometer, which accelerates the ions through a curved path in a magnetic field. The ions separate based on their mass to charge ratio. 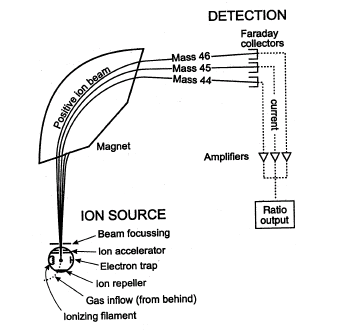 The separated beams of ions are sent to collectors that convert the ions into an electrical signal that can be used to determine the sample’s isotopic composition. Figure from Revesz et al. (2001). For a complete overview of how the TIMS works, check out this website at SERC. 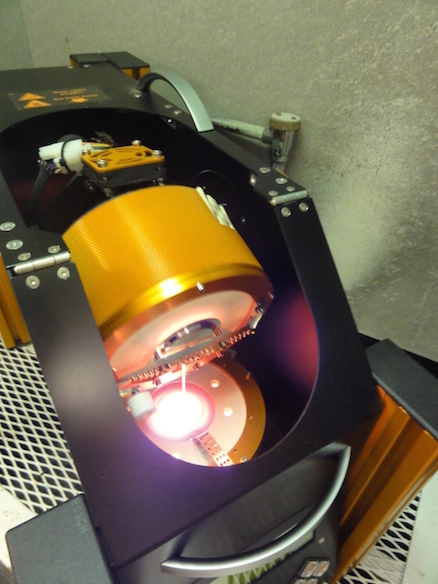 Our tiny samples get loaded onto tiny filaments that heat up in the instrument. 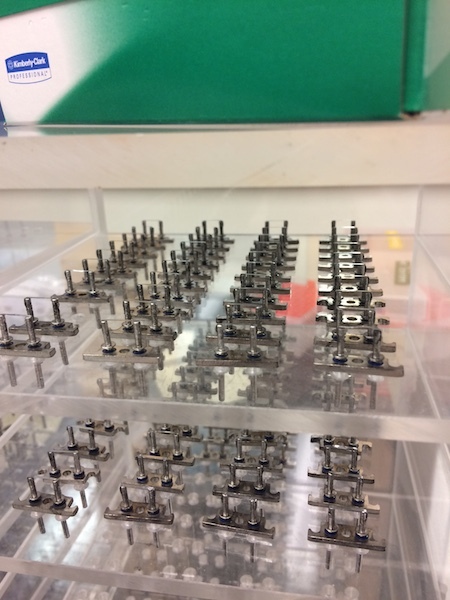 The filaments are stored in neat, orderly rows in a cabinet in the TIMS lab. If you look closely, you’ll see the flat ribbon onto which we’ll mount our samples. You can imagine that the filament loading process is as meticulous as the sample preparation work. 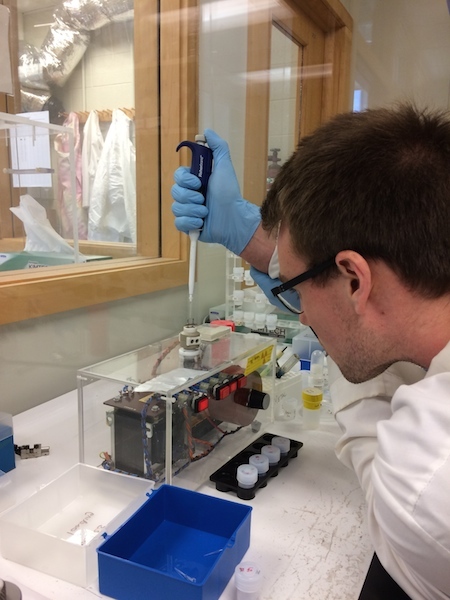 Here, Ben Kumpf (’18) pipettes a sample onto the filament. This is what our sample looks like before we heat up the filament. It’s a single drop. The filaments will get loaded into the TIMS instrument. 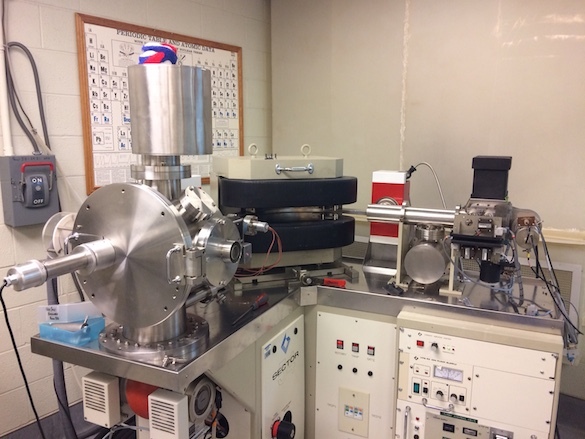 This is one of the TIMS instruments here at the University of North Carolina Chapel Hill that we’ll use to analyze for strontium (Sr). This is the exciting part, when we hope that all of our hard work as paid off. It’s a lot of effort for a single data point, but we know it’s well worth it. Revesz, K.M., Landwehr, J.M., and Keybl, J. 2001. Measurement of 13C and 18O Isotopic Ratios Of CaCO3 using a Thermoquest Finnigan GasBench II Delta Plus XL Continuous Flow Isotope Ratio Mass Spectrometer with Application to Devils Hole Core DH-11 Calcite: USGS Open-File Report 01-257. US Government Printing Office. 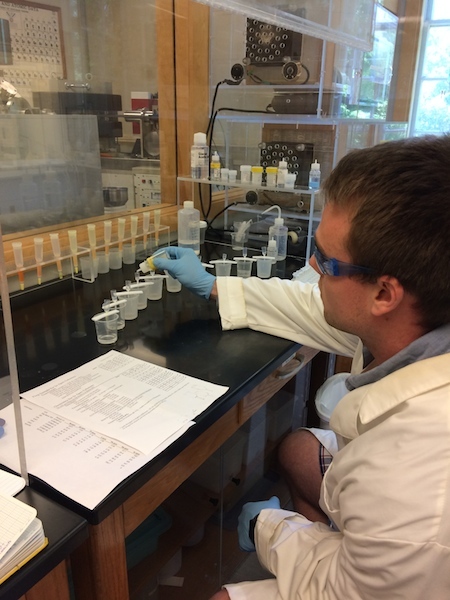 Chapel Hill, NC – As you know, Ben Kumpf (’18) and I are working in the Isotope Geochemistry lab at UNC Chapel Hill. We are measuring isotopes of strontium (Sr), lead (Pb) and neodymium (Nd) in basaltic pillow lavas from northern British Columbia. In order to measure the elements, we need to isolate them from the rest of the elements that make up our rocks. We purify individual elements using the method of column chemistry. 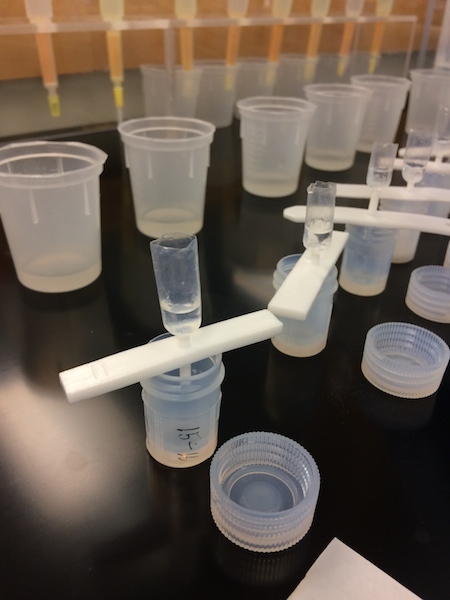 A column is like a filter for elements; we pass our sample through the column and the column captures the element of interest, then we release and collect the element off the column to be analyzed later. The first step to preparing our samples is to dissolve our rock powders in an acid solution. 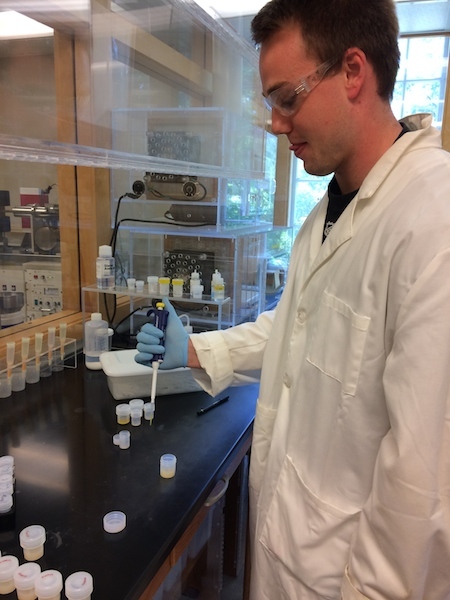 Ben Kumpf (’18) weighs small amounts of rock powder into Teflon vials. We add a series of acids to the vials and let them sit on a hotplate for a day or two until the powders are completely dissolved. 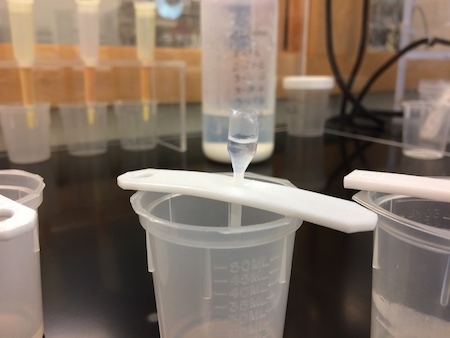 Once the samples are dissolved, we measure out a small amount of the solution into a new vial to run it through the column chemistry process. The first step to make a column “load” solution is to dry the sample solution down to a powder on a hotplate. To the dried-down powder, we add an acid that is appropriate for the column that we’re using. For Sr, we’re adding nitric acid to the vials. Now we’re ready to set up the columns. 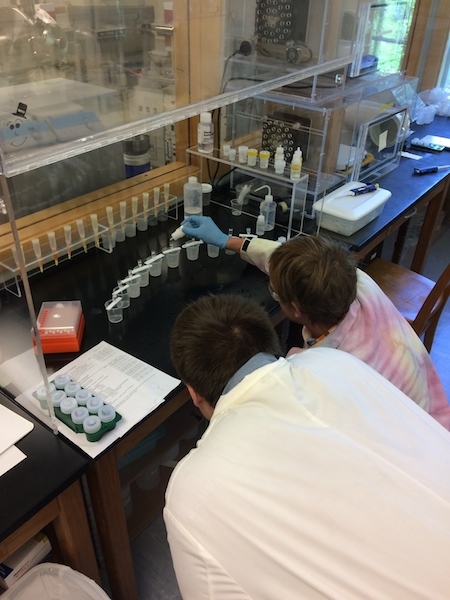 Dr. Ryan Mills (psychedelic lab coat) is showing Ben Kumpf (’18) how to add the resin. This is what a column looks like up close. It’s suspended above a waste beaker. The white material that is filling the tube and neck is the resin. You can see it still settling out of solution. The resin that we use to isolate Sr was developed in response to the Chernobyl accident when it became necessary to remove radioactive Sr from milk (Vajda and Kim, 2010). The chemical column process involves adding a series of solutions to the columns in a sequence that cleans the resin, conditions the resin for the sample load solution, introduces the sample, and rinses the sample through the resin. There’s a lot of pipetting and waiting for the solutions to move through the column during this stage. 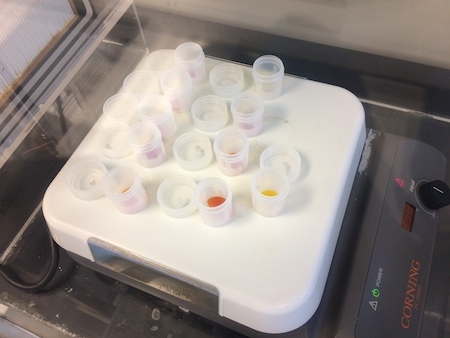 Samples are centrifuged prior to loading. The centrifuge separates any undissolved solids from the liquid so that we only add the liquid portion to the column. These columns are loaded with our Pb solutions. 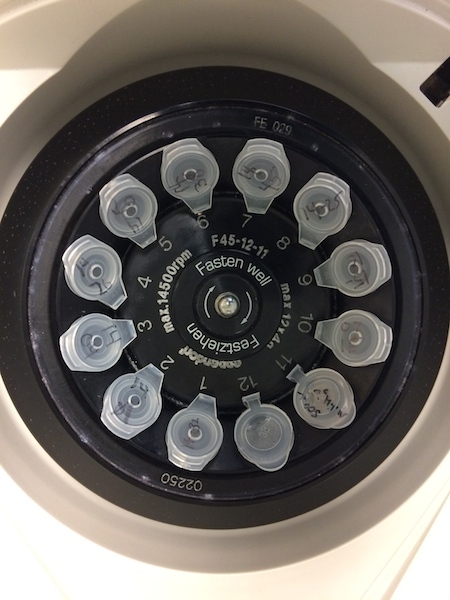 Now that our sample has passed through the column, we release all of the Sr or Pb off of the column and collect it in our sample vial. The last step in the process is to dry down the sample one final time. 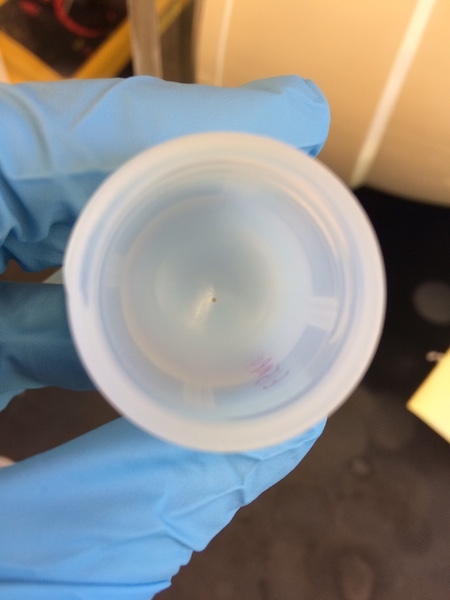 This makes a tiny bead at the bottom our vial. 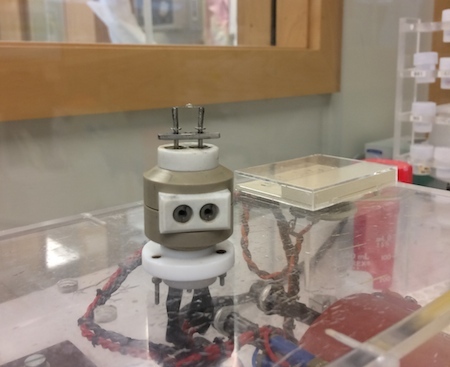 We will load this bead into a mass spectrometer to measure the isotope composition. Now you can see why we need do our sample preparation in a clean lab. Vajda, N. and Kim, C.-K. 2010. Determination of radiostrontium isotopes: A review of analytical methodology. Applied Radiation and Isotopes 68: 2306-2326. What is a clean lab? Chapel Hill, NC – Ben Kumpf (’18) and I are at the University of North Carolina at Chapel Hill to use their lab facilities for isotope analysis. We’re working with small amounts of sample and the instrument has a high degree of analytical precision and sensitivity, so all of our sample preparation occurs in the class-1000 clean lab. A clean lab is a room that is specifically designed to limit the amount of airborne contaminants. Special air filters and air distribution systems keep the environment clean so that we can minimize contamination while we separate and purify the isotopes. Clean labs are classified based on the amounts of specifically sized particles allowed in a cubic meter (~35 cubic feet) of air. If we sample a cubic meter of air in the class-1000 lab and measure the amount of particles that are 5 microns in diameter, we would count no more than 293! For comparison, human hair has a diameter of about 50 to 100 microns, so we’re talking about really tiny bits of airborne dust. Class-1000 refers to Federal Standard 209E, where class-1 is the cleanest space and class-100,000 is the dirtiest (but still pretty darn clean). Federal Standard 209E has been replaced by International Organization for Standardization ISO 14644-1 standards. The new standards include one dirtier and two cleaner classifications and are numbered ISO-1 to ISO-9. Class-1000 is equivalent to ISO-6. UNC Chapel Hill also has a class-100 (ISO-5) clean lab where they process zircons for U-Pb dating. Before we enter the clean lab, we gear up in the gowning room. The garments are designed to protect the wearer and minimize contamination from the wearer’s body. 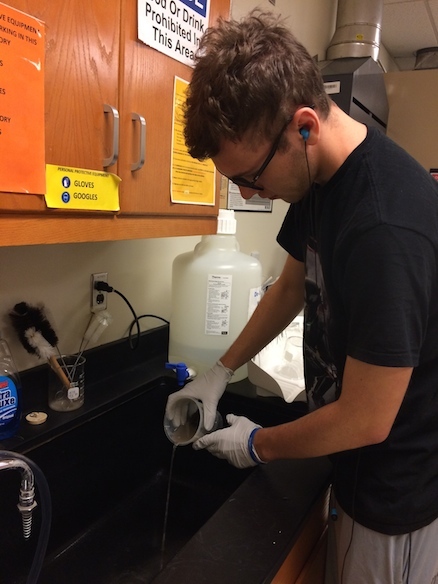 We wear standard lab safety attire, like glasses, gloves, and a lab coat. We also remove our shoes and exchange them for designated (comfy) slip-on shoes that only go in the clean lab. 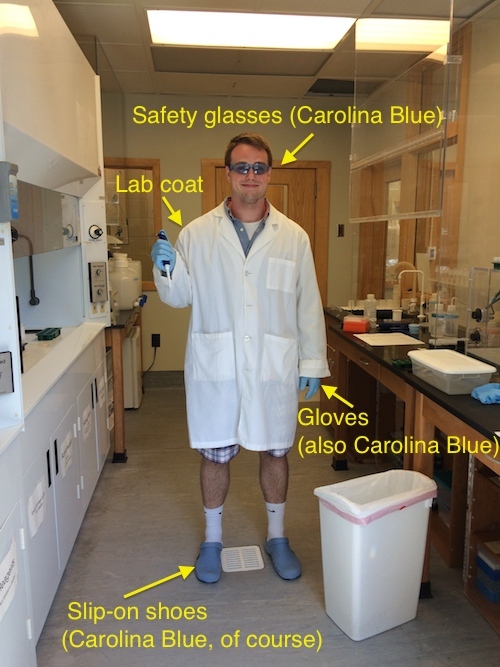 Ben Kumpf (’18) models the clean lab outfit, complete with matching Carolina Blue accents. I see a theme. Let the summer research commence! Chapel Hill, NC – As the College of Wooster Commencement ceremony was just finishing, our rising seniors were starting their summer research. Ben Kumpf (’18) and I are visiting the labs in the Department of Geological Sciences at the University of North Carolina at Chapel Hill. We are using their Isotope Geochemistry Lab to measure Sr-Nd-Pb isotopes of pillow lavas from our study site in northern British Columbia. The first step in the process is to dissolve our rock powders using several strong acids. Fortunately, we were able to send some of our samples in advance, and the good folks here at UNC dissolved about half of our samples for us. 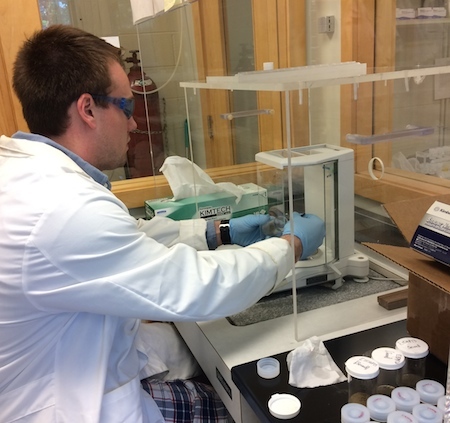 Ben Kumpf (’18) went straight from his flight to the lab and is already hard at work. 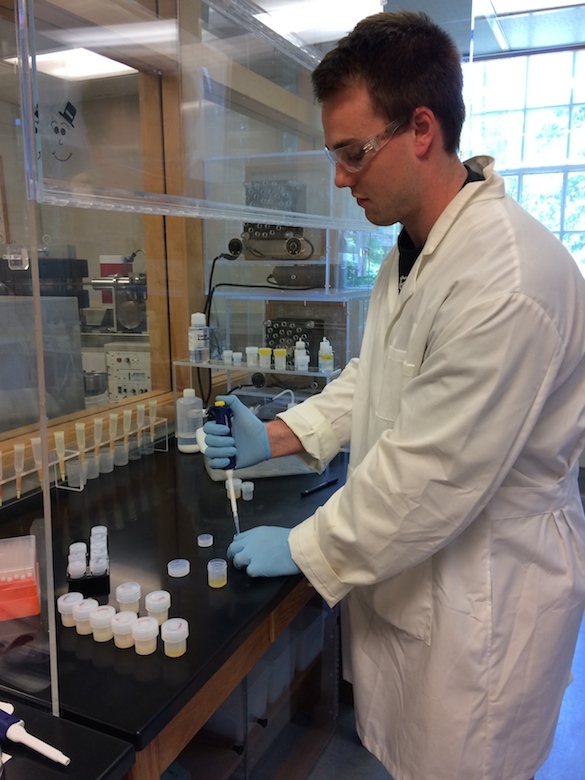 He measured portions of the dissolved samples into new vials so that we can prepare them for Sr isotope analysis. 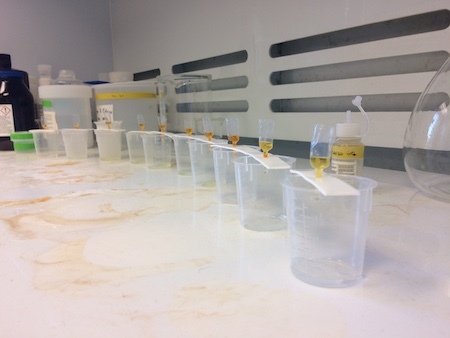 The dissolved samples will be made into solutions that we’ll use tomorrow. Look for our posts in the following week to learn more about how isotopes are analyzed and what we hope to learn. Middletown, CT – Wesleyan University recently hosted the 30th annual Keck Symposium. The Keck Symposium is one of the key features that separates Keck projects from other types of undergraduate research experiences. 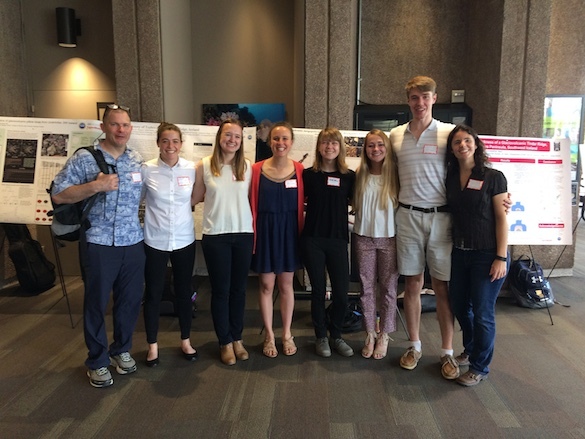 Most other REU programs are confined to the summer, but Keck projects continue through the following academic year and culminate in the Symposium. Research groups reunite to synthesize their individual results and present their work to a broader scientific community. 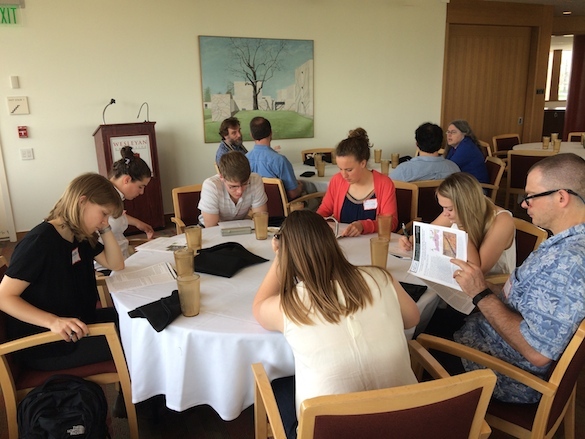 The Symposium is also a best practice and an essential part of the undergraduate research experience. By presenting their research, students transition from private to public discovery and contribute knowledge to the scientific discourse. They develop confidence in their abilities and advance their independence as scientists (Lopatto, 2009). 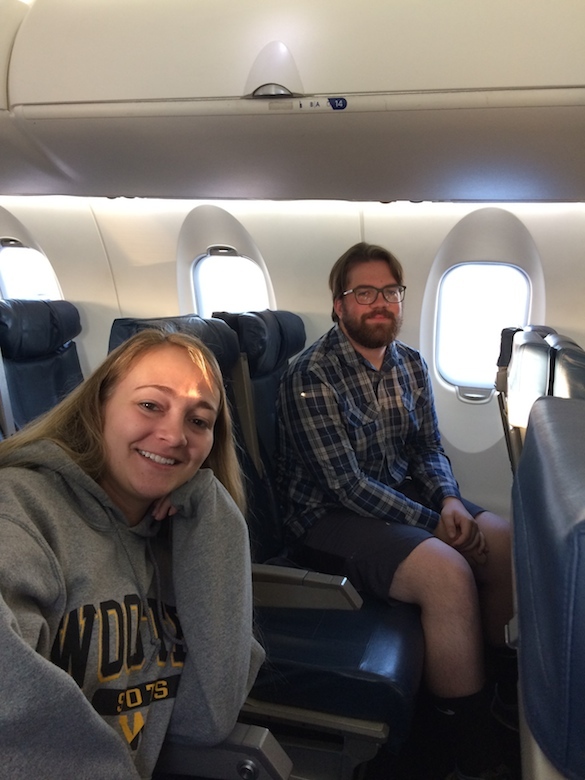 Wooster Geologists, Andrew Conaway (’17), Chloe Wallace (’17), and Meagen Pollock are happy passengers headed to the Keck Symposium. The Keck Symposium format involves two sessions of oral presentations followed by poster presentations. 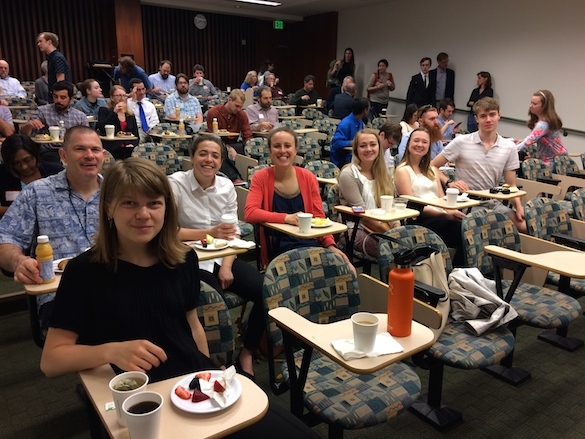 With coffee and muffins in hand, the Keck Iceland group is ready for the morning session. Each research group provides an overview of their projects. Students present their work in a brief 5 minutes. Andrew Conaway (’17) tells the audience about the history of land use around the Wisconsin lakes that he studied. The oral sessions are followed by poster sessions, where the students can discuss their work in detail. 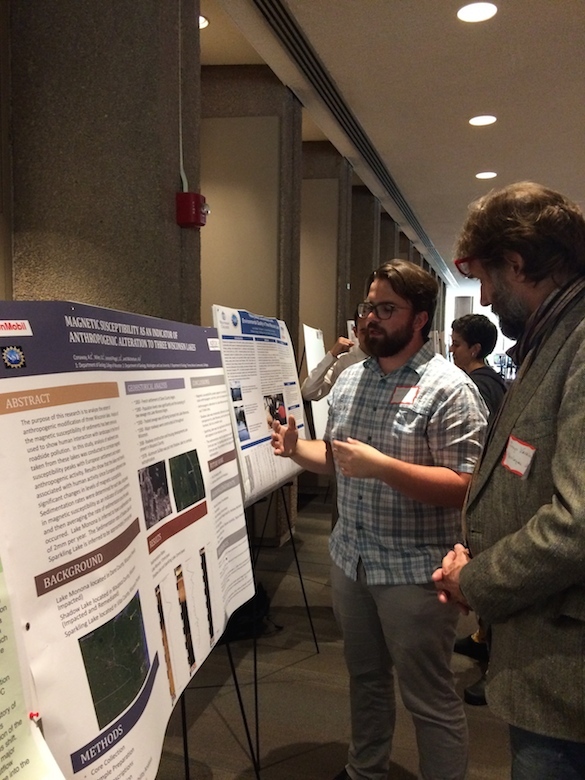 Andrew Conaway (’17) talks about his research on magnetic susceptibility in lake cores. 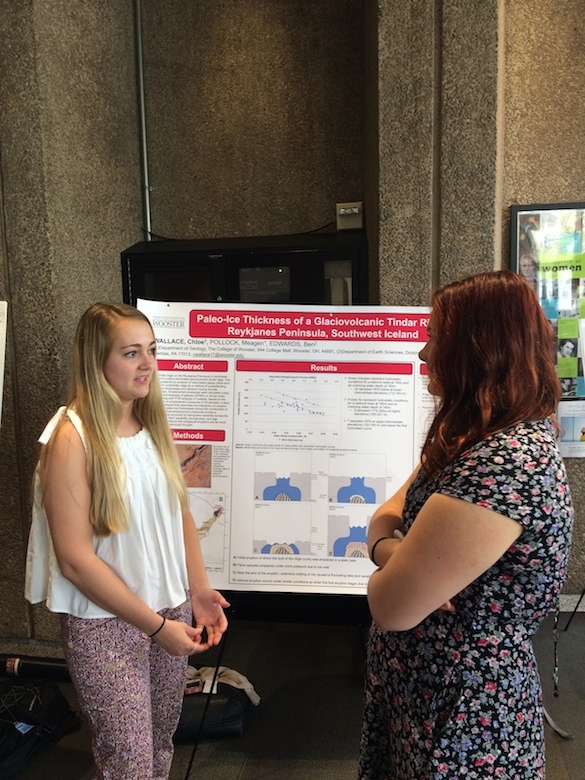 Chloe Wallace (’17) discusses her research on volatile contents of pillow lavas from a subglacial ridge in southwest Iceland. Team Iceland celebrates the end of our poster session with a final group photo. The Symposium also provides an opportunity for faculty to catch up and network. It’s an important professional development opportunity, particularly for early-career faculty. Another important thing that happens at the Keck Symposium is the review of copy-edited short contributions. Each student writes an extended abstract of ~2500 words and 5 figures, which is compiled and published in a Symposium Volume. Team Iceland goes through their short contributions one last time at the lunch break. It’s an intense weekend, but the smiles on our faces at the end of it all (despite the early morning flight) show that it’s worth the effort. Wooster, OH – Last weekend, The College of Wooster hosted the Expanding Your Horizons conference. 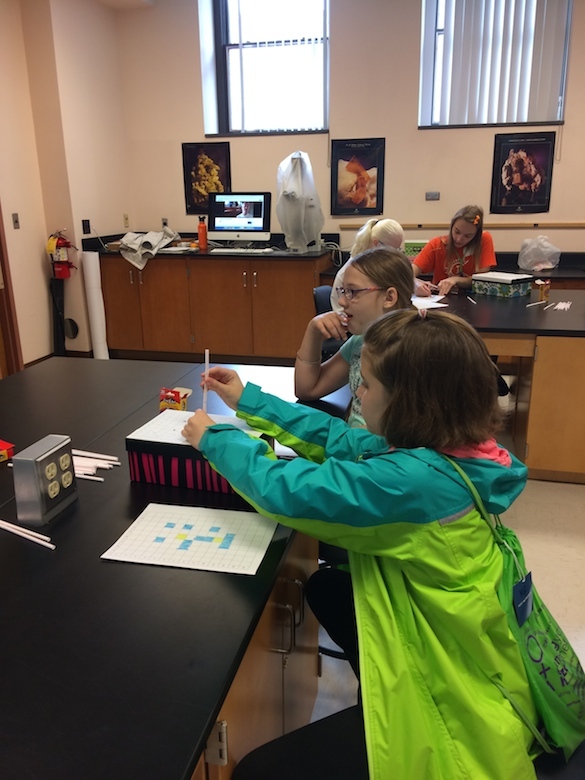 About 240 fifth- and sixth-grade girls participated in hands-on science workshops on computer science, math, geology, chemistry, biology, physics, and neuroscience. 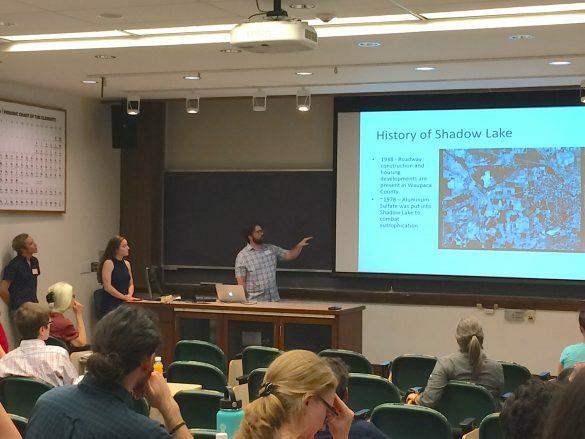 This year, I went back to my roots in marine geology to run a workshop on how we see what’s on the seafloor. 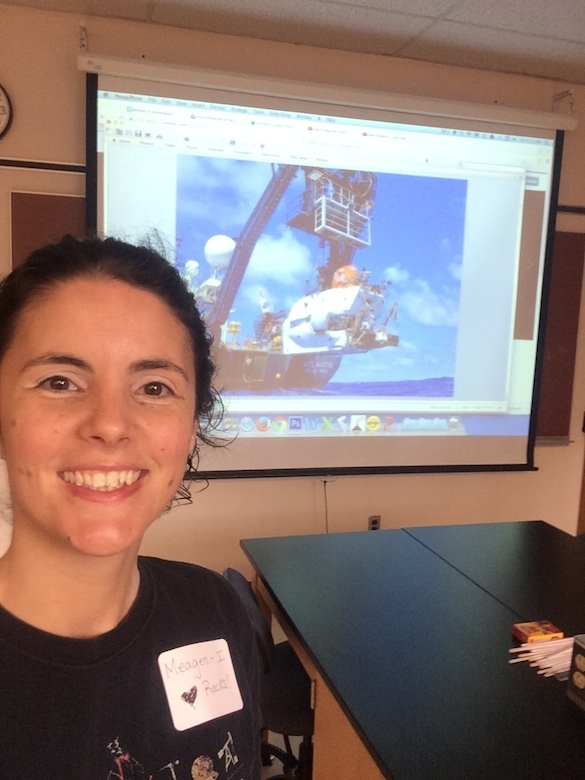 Pre-workshop selfie, complete with “I love rocks” name tag and photo of the Alvin submersible to jumpstart our conversations. I put together a version of this activity about how geologists “see” under ice, the ocean, or inside the Earth. 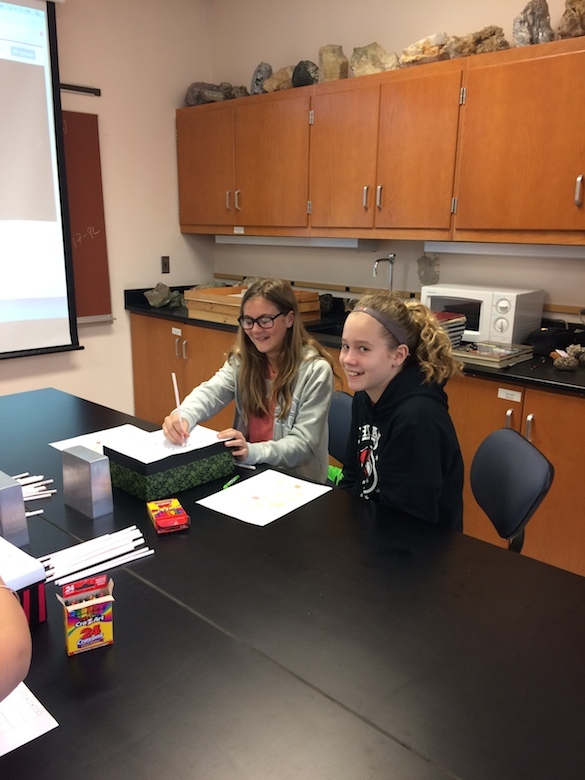 Most of the girls guessed that we use sonar to measure the depth of the ocean floor, and this short video was helpful for understanding how sonar works. Each group of girls was given a shoebox containing a mystery letter. They used their “sonar straws” to probe the bottom of the shoebox. They plotted their measured depths on their grid and used their data to interpret the letter in the box. 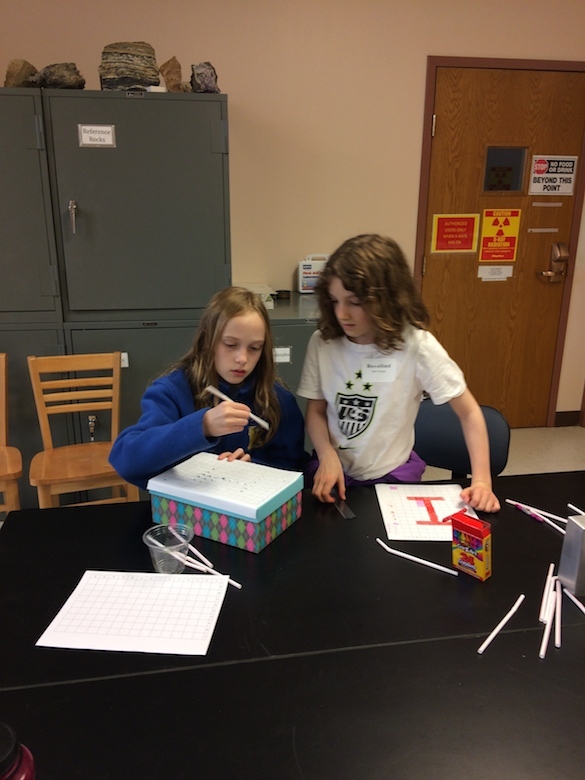 Poking straws into boxes seems not-at-all scientific and maybe a little silly at first, but the girls starting making and testing hypotheses pretty quickly. You can see the map of “hits” and “misses” as they record the results of their hypothesis testing. We found that the easiest letters to identify were those that had right angles, like “I” and “E.” Letters with triangles (like “N”) or curves (like “S” and “C”) were harder to identify. Along the way, we learned about reproducibility and sampling strategy. As it turns out, if your data point is wrong, or all of your data are clustered in one corner of the map, it’s hard to make an interpretation. Still, each session managed to collect enough data to interpret the word “S-C-I-E-N-C-E” when the groups brought their maps together. We watched part of a video on women in oceanography and I told them about Deep Sea Dawn, an inspirational woman oceanographer who maps the ocean floor and builds Legos! The girls asked incredible questions about what it’s like to be out at sea and about my favorite rock (basalt, of course). Finally, we watched a video about how we shrink styrofoam cups when we conduct deep-sea research and I showed them some of the cups from my cruises. Their enthusiasm and energy were the best reminders of why I do what I do. I’m so grateful to all of my colleagues and educators everywhere who work hard every day to inspire the next generation of young geoscientists.